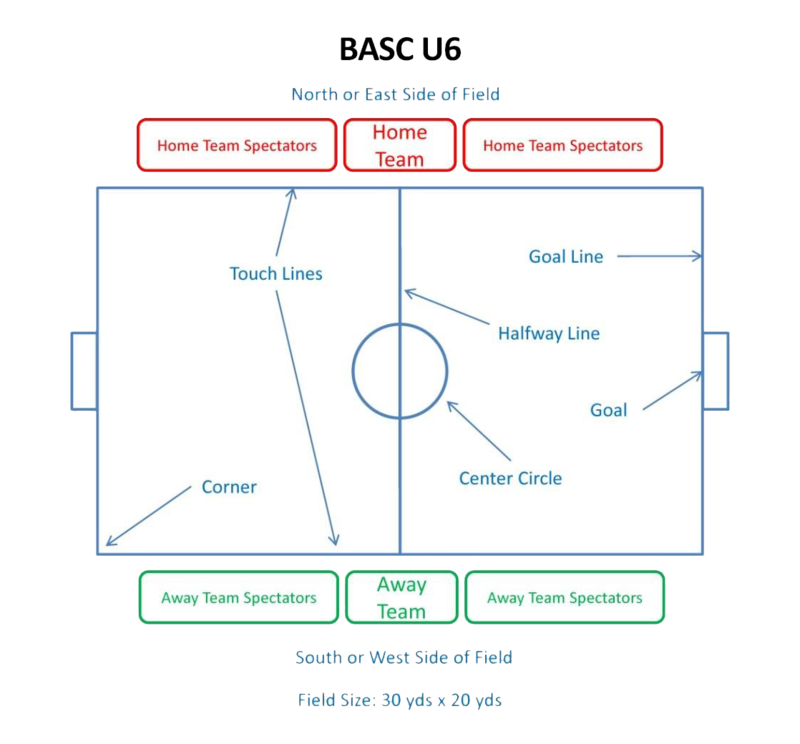 All rules herein are for BASC Closed League matches and supersede FIFA, USYS and OSA rules for recreational soccer. Items not specifically addressed herein shall conform first to OSA rules then USYS and then FIFA. For play outside of BASC Closed League OSA rules shall apply. A.Field dimensions: The field of play shall be rectangular. Its length being no more than thirty (35) yards or less than twenty (25) yards and its width not more than twenty (25) yards nor less than fifteen (15) yards. The length in all cases shall exceed the width. BASC U6 fields are approximately 30x20. 3. A center circle with a three (3) yard radius. 5. Goal area: Three (3) yards from each goal post and three (3) yards into the field of play joined by a line drawn parallel with the goal line. C. Goals: The size of hockey goals or approximately 4’x 6’. A. Maximum number of players on the field per team at any one time is four (4). There are no goalkeepers. The minimum number of players to start the match is two (2). B. Maximum number of players on the roster should not exceed eight (8). C. Substitutions: Substitutions shall be unlimited and at the referee’s discretion will be permitted at any stoppage of play. A. Recreational Referee or higher (Registered 09 recommended) is desired but not mandatory, games may be played with Parent / Coach officiating the game if there is a shortage of referees so that the match can start on time. B. All law infractions shall be briefly explained to the offending players. A. The game shall be divided into four (4) periods of ten (10) minutes each with a five (5) minute break between each period. B. Clock runs during the game, stopping only for the end of each 10 minute period. A. Opponents must be three (3) yards from the center mark while kick-offs are in progress (outside the center circle). A. All fouls and misconduct will result in an indirect kick with the opponent five (5) yards away. B. All infractions must be explained to the offending player. A. All free kicks shall be indirect. B. A goal may not be scored until the ball has been played or touched by a second player of either team. C. No kicks are to be taken by the attacking team within the defending team’s goal area. D. Opponents must be five (5) yards away before kick is allowed. Law XIV – Penalty Kicks No penalty kicks shall be taken during these games. A. The player selected to throw must keep both feet on the ground while the ball is being thrown. Further, a portion of both feet must be on or behind the line as the ball is being thrown. If there is a foul throw-in, the referee must explain the proper method to the player and call a re-throw. If the second attempt also results in an infraction, the opposing team shall be awarded the throw-in at the same spot on the field. A. Goal kick is taken anywhere within the goal area. B. Opponents must drop to the build out line also known as the Halfway Line which promotes playing the ball out of the back in a less pressured setting. When the defender is taking a goal kick the opposing team must move behind the halfway line until the ball is put into play. Once the opposing team is behind the build out line, the defender can kick / pass the ball to put it into play. After the ball is put into play by the defender the opposing team can cross the half line and play resumes as normal. Ideally, the defender will wait to put the ball into play once all opponents are past the build out line However; the defender can put the ball into play sooner but he or she does so accepting the positioning of the opponents and the consequences of how play resumes. C. A goal may not be scored directly from a goal kick. A. Opponents must be five (5) yards away from the ball. Uniforms: Team uniforms shall consist of like colored jerseys, shorts and socks. No player names on jerseys. The home team will wear lightest colored jersey. The away team will wear the dark jersey. Unless agreed upon by both coaches, the team not wearing the correct uniform will be required to change. Non-uniform clothing is allowed based on weather conditions, but uniforms must still distinguish teams. Undershirts exposed from beneath jerseys should be the same or similar color of the jersey. Any sponsor’s names, logos or other wording/graphics must be approved in advance by the BASC Board. Socks must cover shin guards and color must be consistent for the team. Any tape applied must be consistent with the sock color. Sideline Behavior:Coaches and spectators should keep all comments positive and supportive of the players. Spectators should refrain from providing playing instructions to the players which should only be done by the coaching staff. No referee abuse will be tolerated. Coaches may be cautioned or sent off by the referee for behavior in violation of the BASC Code of Conduct by the team’s staff, players or their respective spectator sidelines. Match Officials: All matches are to be officiated by a center referee. No Sweeper-Keepers: Coaches are strongly encouraged to not allow a player to “camp out” in front of the goal to prevent scoring as all players need to be encouraged to be involved in active play. Referees may remind coaches of this policy but no penalty or sanction shall be enforced by the referee. Coaches who willfully do not follow the policy will be subject to disciplinary review. Slide Tackles: Slide tackles shall not be permitted. Any player engaging in slide tackles should be counseled to not repeat. Repeated infractions may result in the player be cautioned and/or red carded. After each game, the coach in possession of the Game Forms is to phone in the score to Gotsoccer using the phone #, Event ID and Pin # at the top of the game form. Coaches must maintain the game forms, in their possession, until 30 days after the season is over. Coaches must provide, to BASC, any game form requested. Scores/standings are not published but are used to assist in seeding teams for the following season. Playing Time/Substitutions/Rotations: All recreational players are required to play at least 50% of each game for which they are present and physically able to play. Games/coaches will be periodically reviewed for compliance by the club. Coaches found to not be in compliance with this rule are subject to disciplinary review. 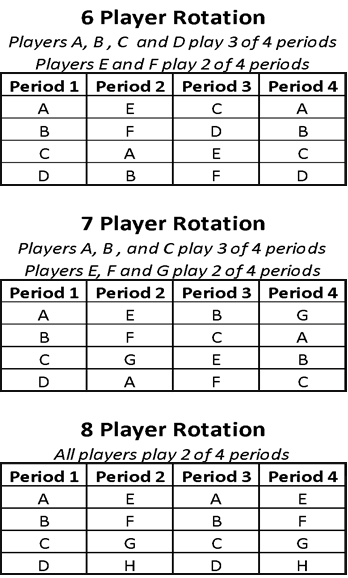 Organized rotations are very important and coaches should maintain documentation of rotations for each game. Below are recommended rotations for various roster sizes.